Your stove is likely one of the most useful appliances in the home; however, it can also be the most dangerous if you are not careful. Whether you have an electric or gas stove, there are several important safety precautions to keep in mind when cooking food. When cooking food on an electric stove, the metal coils allow for the flow of electrical current, converting electricity to heat. Overall, the safety features of an electric stove are much safer as homeowners do not need to worry about gas. This may seem obvious, but it is never a bright idea to place plastic containers on the electric burners, regardless of whether or not it is in use. Food that is left on the stovetop for an extended period of time is usually not safe to eat. In addition, you should never store items of any kind on the stove’s top. Keep the entire area around the unit clean as you do not want anything unexpected to happen. The last thing that you will want to happen is to turn on your stove and not realize that a piece of paper was too close to the burner. Although this situation rarely happens, there is still a possibility that an item may catch on fire. If you experience a loss of power in your home while you are cooking, be sure to turn the appliance off. If the unit is left on and power is returned to your home, it will likely heat up and ignite anything flammable within the area. Be sure to also turn off all of the other appliances in your home when a power outage occurs. When cooking with a gas stove, you will be required to be slightly more careful as cooking with this kind of stove involves propane or natural gas. Because gas stoves use an open flame, these flames can ignite spilled food and other debris, potentially causing flare-ups. When cooking with pots and pans, make sure that the handles are turned to the side, not over the front edge. If the handles are made of metal, they will likely get hot. If the handles are hanging over the front edge, this leaves an opportunity for someone to bump into the pot or pan. In order to avoid burns and other injuries, always be sure that the handles are turned to the side. Whenever any type of fuel is burned, carbon monoxide is present, especially with stoves that use gas. As carbon monoxide can be very deadly, it is vital to install a carbon monoxide detector to protect your family and your home. By following these safety tips, you will have an easier time avoiding potential injuries and burns when cooking. And if the need arises, contact C&W Appliance Service to schedule an appointment with one of our technicians. 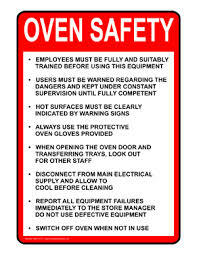 Our technicians are highly skilled and more than capable of handling your oven repair needs.